Most of us know and love this holiday classic. I spruced things up a bit by adding on some holiday-colored sprinkles and decorating sugar. 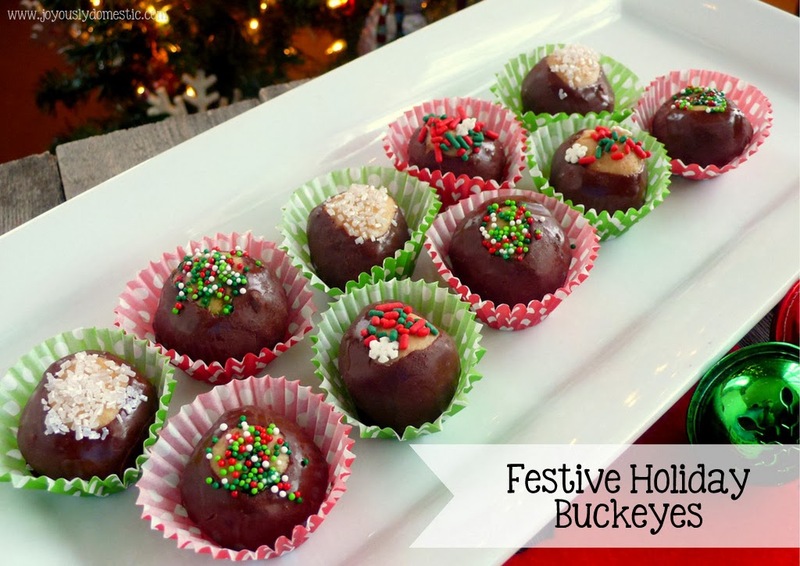 Not only does adding edible "bling" to these buckeyes give them a much-need pop of color, it, also, helps to cover up the hole left behind on the top of the buckeye by the toothpick used for dipping. And, I love the variety of mini cupcake/candy papers that can be found these days. They really jazz things up and I know these will add a touch of festive flair to my Christmas platters this year! Yields about 6 dozen buckeyes. Melt the peanut butter and butter over low heat in a medium sauce pan. Stir occasionally until smooth and melted. Remove from heat. Stir in the confectioner's sugar until well-combined. Using your hands, form into small balls and place onto a parchment paper-lined baking sheet. Stick a toothpick into the top of each ball. Place in refrigerator for thirty minutes to cool and set. Meanwhile, melt the chocolate chips in a double boiler until smooth. Stir in the paraffin wax until melted. 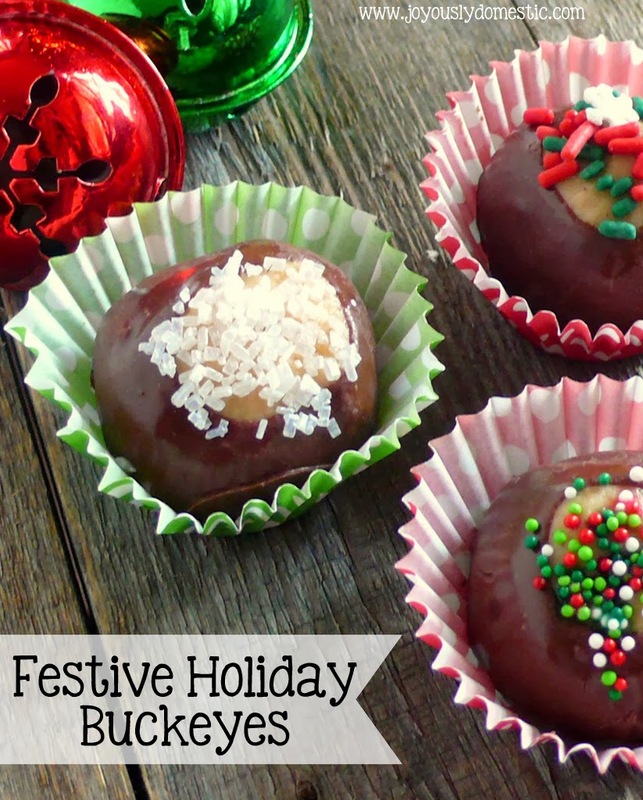 Dip peanut butter balls into the melted chocolate. Coat almost up to the toothpick - leaving a small surface of peanut butter uncoated at the top of each ball. Return balls to the baking sheet. Remove toothpicks. Place back in the refrigerator until fully cooled and set. Store in airtight container until ready to serve. These keep well for 2 - 3 weeks in a cool place. Moisten the top peanut butter surface only of each buckeye with your finger that has been dipped in cool water. Sprinkle on the garnishment of your choice. Do not over moisten. Otherwise, the sprinkles or sugars can dissolve/melt. You may, also, enjoy these fun Reindeer Noses. My kids loved passing these out to their school friends last year!